This is one of the common lock problems that majority of us have faced at some point or the other in life. Sometimes, even new keys with a burr present this problem. A quick solution is to jiggle the key up and down and see if this action releases the key. More often than not this seem to work. A loose keyhole plug might also be the underlying cause of why your keys are stuck. In that case, stabilize the metal circle around the key with the finger of one hand while gently twist the key with another hand to free it up. If both these tricks won’t work, spray some lubricant into the keyhole and that should help in removing the stuck key. However, if the experiment fails, you are better off getting help from a professional locksmith to prevent the lock from getting damaged. Your key getting broken inside the lock can be very frustrating. But, there are a couple of things that can be tried before seeking professional help. (Always remember to insert the key slowly than rushing it through). When there is a piece of the key residing inside the lock, find a needle nose pliers and try pulling out the fragment. Take care to ensure that the lock is in the vertical position while doing this. Another helpful tool is a scroll saw blade or jigsaw. You can slide in the space abutting the broken fragment and attempt to hook the teeth of the saw into the teeth of the key fragment and pull it out. This way, you can retrieve the fragment and try another key perhaps. Yet another tool is a small screwdriver with flathead. The screwdriver can be helpful in getting the lock to a vertical position before putting the saw blade or pliers to use. The screw driver can also act as part of your key that came off the stuck fragment allowing you to open the door. After the door is opened, you can again trying removing the fragment with the help of the saw blade or pliers. Some door locks tend to freeze up during the winter days. When this happens, applying low heat constantly to the lock is one way to solve the problem. A blow dryer can be helpful in this process. 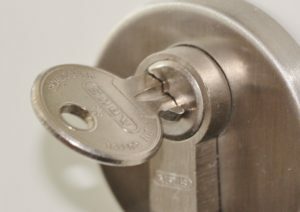 Notice however, that high heat can potentially damage the lock as well as the door and getting professional help is a safe way when low heat does not help. When debris or dirt accumulates inside the lock, the mechanism tends to get clogged. You can try using a cotton swab that is lightly damp to clean the mechanism. Alternatively you could also try putting a few drops of automobile lubricant into keyhole. If both these efforts fail, then, you should seek help from professional locksmiths. When your pushbutton lock fails to lock, chances are that it is on the passage mode. Depending on the type of pushbutton lock, you can check the directions provided by the manufacturer to turn off the passage mode. You forget the code for your safe and try a few codes in quick succession. You only get a beep or a red light that is blinking at regular intervals. Perhaps you don’t realize that you are on a ‘penalty lockout’. Most safe locks have this as an in-built feature. The best thing you can do in this situation, is, to simply relax for about 15 to 20 minutes and try again, when the lock-out feature would have been de-activated. Keeping contact information of your nearest professional locksmith handy is a great idea, because we never know when a problem surfaces.